This wine is a tribute to Pedro Pavone-Voglino, the father of Santa Ema’s founder. Blessed with a great pioneering instinct and abundant determination, Don Pedro embarked on the long journey from his home in Rivalta in the Italian Piedmont to the New World in 1917. Upon reaching Chile, he settled in Isla de Maipo where he was charmed by the landscape and its extraordinary characteristics for winegrowing. In 1931 he acquired the first property that would become Viña Santa Ema. He loved cars and was an excellent racecar driver. At the age of 28 he drove across the Andes into Argentina and was a member of the first Harley Davidson team in Chile. 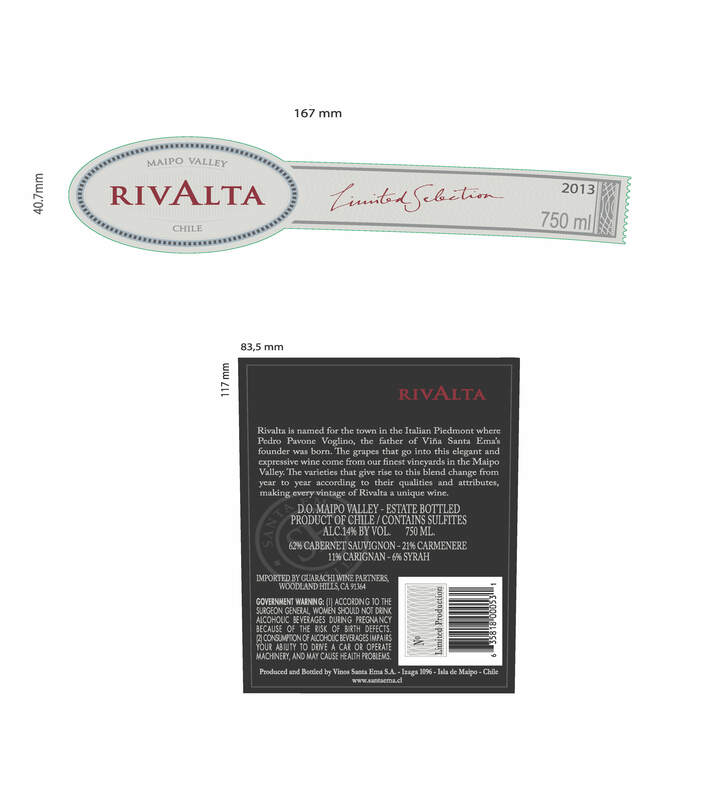 Rivalta is a *Limited Production* blend made with the finest grapes of each vintage and sold in hand numbered bottles. AGING: The wine spent a total of 20 months in first-use French oak barrels, divided into an initial 15-month period for aging the individual varieties separately, and then a second 5-month period for the final blend. The wine was aged for a minimum of one year in the bottle before its release to market. TASTING NOTES: Bright ruby red. Intense aromas of black fruits, blueberries, black currant, black pepper, and a touch of mint and chocolate that lend elegance. Well rounded with excellent structure, ripe tannins, tremendous texture, and a persistent finish. Pairs well with lamb and game meats, such as venison and boar. Delicious with duck magret, spicy dishes and chutneys, and mild red meats, such as veal.